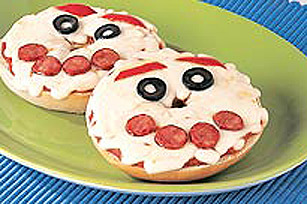 Move over plain-Jane sandwiches - our fun and fanciful pizza bagels are here to steal the show. Topped with sauce, cheese and your favourite pizza toppings, these baked pizza bagels are sure to please kids of all ages! SPREAD pizza or pasta sauce on bagel halves, tortillas or pita bread. ADD desired toppings (such as green peppers, sliced hotdogs, Oscar Mayer Bacon Bits or mushrooms) and sprinkle with cheese. BAKE at 400°F for about 10 minutes or until cheese melts. For variety, try new toppings such as red peppers, black olives and tomatoes.